Ceva Logistics (SIX: CEVA.Z.EB) outlined a three-year growth strategy after its October tie up with ocean carrier CMA CGM, putting Ceva into the top tier of freight forwarders in ocean shipping. Last month, CMA CGM thwarted an unsolicited offer from Danish logistics firm DSV (Nasdaq OMX: DSV.C.IX) with its own tender offer to Ceva shareholders. The French carrier offered to buy the remaining 75% of Ceva it did not own at 30 Swiss Franc ($30.06 US dollars), a 9% premium to the company's share price as of its May initial public offering and the same as DSV's offer price. CMA CGM said it plans to keep Ceva listed on the Swiss bourse, with separate management and corporate governance. CMA CGM’s tender is expected to close next April. Still, CMA CGM is putting in one of its own at Ceva. Nicolas Sartini, who currently heads the APL segment of CMA CGM, will become chief operating officer and deputy chief executive officer at Ceva effective January. Along with the tender offer, CMA CGM sold its freight management business to Ceva. The addition of the CMA CGM Logistics business is expected to bring in an additional 170,000 twenty foot equivalent units (teu) of containers, bringing its total volume to 1 million teus annually, putting it on par with Expeditors International (Nasdaq: EXPD) in terms of container volume. Ceva expects the closer ties to the fourth largest ocean carrier to result in annual revenue of $9 billion by 2021, a 5% growth target. CMA CGM’s freight management business will bring in $630 million of that. 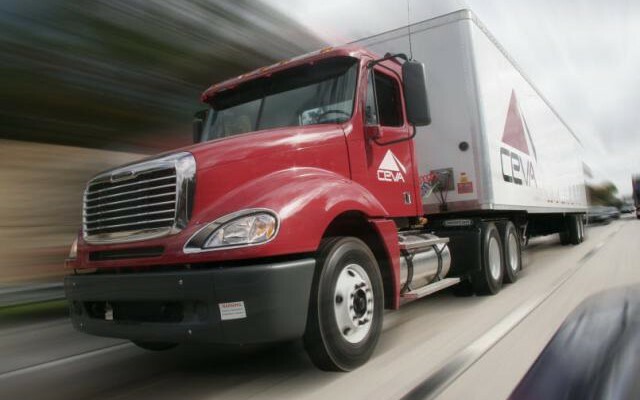 Likewise, Ceva expects adjusted operating profit of $470 million to $490 million by 2021, up from a prior guidance of $380 million. The operating profit would represent an adjusted margin of 5%, up from the 3.3% margin it reported last year. Ceva plans to hit those marks through “a combination of our commercial and sales focus, cross selling with CMA CGM customers, our own productivity acquisition, the integration of CMA CGM Logistics within Ceva and sharing resources with CMA CGM in the field of procurement and administrative functions,” said Chief Executive Officer Xavier Urbain. The commercial and sales focus will target higher margin and growth segments such as small-and-medium size enterprises, less-than-container load, cold chain logistics, and e-commerce and retail verticals. Likewise, it aims to market to new geographies such as Asia, Middle East and Africa. The cross-selling opportunities with CMA CGM will stem from the previously announced acquisition of CMA CGM Log. Ceva is paying $105 million, representing a 6.6-times multiple of CMA CGM Log’s operating profit last year. CMA CGM Logistics saw revenue of $650 million last year, with operating margin between 3% and 4%. Ceva manages 96 million square feet of warehouse space and handles 729,000 teus of containers, 1.9 million tons of ground freight and 480,000 tons of air freight.